Pregnancy is supposed to be the most joyous time in your life. However it can often be a stressful, confusing, fearful time, which can lead to depression. 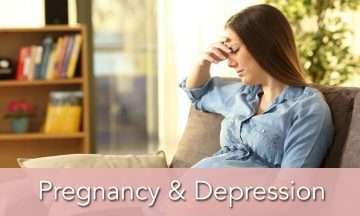 According to The American Congress of Obstetricians and Gynecologists (ACOG), between 14-23% of women will struggle with some symptoms of depression in pregnancy. Depression is a medical illness that causes a persistent feeling of sadness, hopelessness, or inadequacy. Depression can cause physical symptoms, as well, such as a loss of energy, difficulty maintaining concentration, or loss of interest. Depression if left untreated can lead to potential dangerous risks to both mom and baby. Untreated depression can lead to improper nutrition, drinking, smoking, and suicidal behavior, which can lead to low birth weight, premature birth, and developmental problems. A woman who is depressed likely does not have the desire or capability to properly care for herself and therefore will not be able to properly care for her developing baby. If you are experiencing depression during pregnancy, it is more likely that you will experience postpartum depression. Many women will experience a case of the “baby blues” after baby is born. They will experience intense hormonal swings and seemingly random bouts of crying. They may also feel exhausted, unable to sleep, trapped, anxious, nervous, and worried about being a good mother. About 80 percent of women will experience the “baby blues” so if you should suffer from this for a short period of time there is no need to worry to much over it. If it lasts more than two to three weeks however, there may be cause for concern. About 1 in 10 will experience a more severe and longer lasting depression after baby is born- which is postpartum depression. About 1 in 1000 women will develop a more serious condition called postpartum psychosis. If you feel you are experiencing more than just the “baby blues” please consult your primary care physician immediately for help. If you feel you are struggling with depression during your pregnancy, please reach out for help. Whether it be your primary care physician or OB/GYN or Midwife, the help of a medical professional is a wise choice to ensure proper care for you and your baby. If you have suicidal thoughts, call the toll free number at the National Suicide Prevention : 1-800-273-8255 for help.